This video builds on the concepts presented in Preparing for Standing (HP4) and introduces postural and movement components needed for walking, facilitating more active trunk responses, and the importance of diagonal weight shifts. Activities are demonstrated on a doll for clarity. 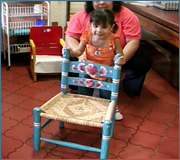 Clinical application examples are demonstrated with children with various levels of disabilities.